For those of you interested in Classic trials, don’t forget the Mortimer Classic club will be running their Jack Englefield trial this Sunday ( 4th Feb) at Bennett’s Hill. This entry was posted in Newsletter on January 31, 2018 by Aldermaston Nomads. Once again our Christmas trial was held at the Pickling Yards in Mortimer on a cold, but thankfully dry Saturday between Christmas and New Year. As is often the way, we saw our best turn out of the year – 41 riders. Prior to the start a presentation was held to recognise the 25+ years of service to club of Chris Dowse. Chris has been an unerring Club Secretary and our thanks go to her for her support over the years. 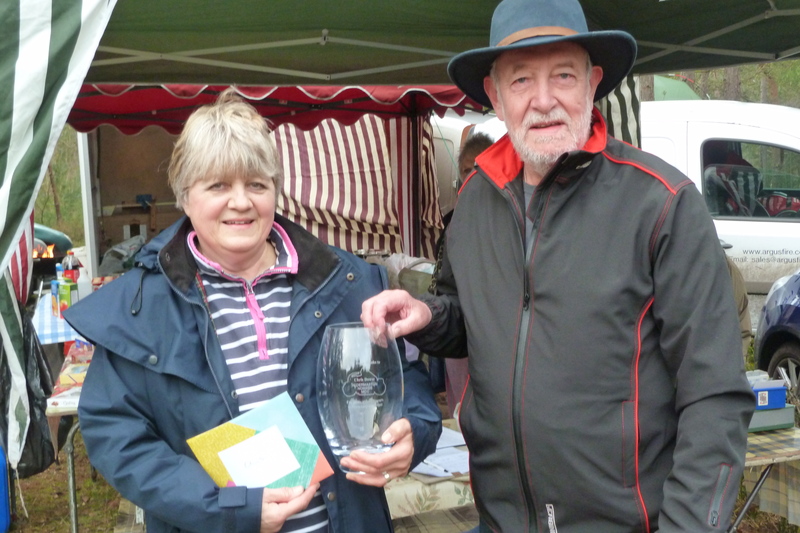 Chris receiving her award from Club President – Mike Leeke. Reynard had set out 10 good sections utilising new areas plus a couple of old favourites. The sections were possibly tougher than usual with some of the new sections cutting up more than expected. The event itself was enjoyed by all, and we saw a good range of riders in all classes, including quite a few new faces young and old. Thanks as always to Haines family for providing hot dogs and mulled wine, Reynard for setting the course and to you all for supporting the raffle in aid of the landowners charity. This entry was posted in Newsletter on January 14, 2018 by Aldermaston Nomads.